We provide a timeless patio, great service and staff along with a relaxing atmosphere to enjoy alongside our fantastic beer and wine offerings. 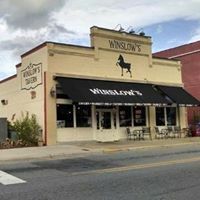 Winslow's is Eastern North Carolina's premier spot for craft beer selections! We offer a tapline of 46 American Craft Beers, Micro- Brews and Seasonal selections for the Beer lover! Winslow's is proud to offer the areas largest selection of Fine Bourbons and Whiskeys as well as an incredible 22 wines by the glass! We are located at 120 West Fifth Street in Uptown Greenville.